mobile – Carpet Bomberz Inc.
Photoshop is the only application from Adobe’s suite that’s getting the streaming treatment so far, but the company says it plans to offer other applications via the same tech soon. That doesn’t mean it’s planning to phase out its on-premise applications, though. via What’s a Chromebook good for? How about running PHOTOSHOP? • The Register. Turn now to this announcement by Adobe and Google in a joint effort to “stream” Photoshop through a web browser. A long time stalwart of desktop computing, Adobe Photoshop (prior to being bundled with EVERYTHING else) required a real computer in the early days (ahem, meaning a Macintosh) and has continued to do so even more (as the article points out) when CS4 attempted to use the GPU as an accelerator for the application. I note each passing year I used to keep up with new releases of the software. But around 1998 I feel like I stopped learning new features and my “experience” more or less cemented itself in the pre-CS era (let’s call that Photoshop 7.0) Since then I do 3-5 things at most in Photoshop ever. I scan. I layer things with text. I color balance things or adjust exposures. I apply a filter (usually unsharp mask). I save to a multitude of file formats. That’s it! To do that, the researchers coated a lithium anode with a layer of hollow carbon nanospheres, to prevent the growth of the dendrites. via Batteries take the lithium for charge boost • The Register. As research is being done on incremental improvements in Lithium Ion batteries, some occasional discoveries are being made. In this instance, the anode is being switched to pure lithium with a coating to protect the very reactive metal surface. The problem with using pure lithium is the growth of micro crystalline “dendrites”, kind of like stalagmites/stalactites in caves, along the whole surface. As the the dendrites build up, the anode loses it’s efficiency and that battery slowly loses it’s ability to charge all the way. This research has shown how to coat a pure lithium anode with a later of carbon nanotubes to help act as a permeable layer between the the electrolytic liquid in the battery and the pure lithium anode. In past articles on Carpetbomberz.com we’ve seen announcements of other possible battery technologies like Zinc-Air, Lithium-Air and possible use of carbon nanotubes as a anode material. This announcement is promising in that it’s added costs might be somewhat smaller versus a wholesale change in battery chemistry. Similarly the article points out how much lighter elemental Lithium is versus the current anode materials (Carbon and Silicon). If the process of coating the anode is sufficiently inexpensive and can be done on a industrial production line, you will see this get adopted. But with most experiments like these, scaling up and lowering costs is the hardest thing to do. Hopefully this is one that will make it into shipping products and see the light of day. The acquisition makes Blippar one of the largest AR players globally, giving it a powerful positioning in the AR and visual browsing space, which may help its adoption in the mass consumer space where AR has tended to languish. via UK Startup Blippar Confirms It has Acquired AR Pioneer Layar | TechCrunch. Layar was definitely one of the first to get out there and promote Augmented Reality apps on mobile devices. Glad to see there was a enough talent and capability still resident there to make it worthwhile acquiring it. It’s true what they say in the article that the only other big name player in this field helping promote Augmented Reality is possibly Oculus Rift. I would add Google Glass to that mix as well, especially for AR (not necessarily VR). Here’s my latest DIY project, a smartphone based on a Raspberry Pi. It’s called – wait for it – the PiPhone. 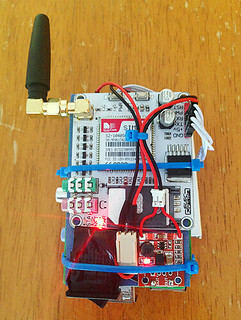 It makes use an Adafruit touchscreen interface and a Sim900 GSM/GPRS module to make phone calls. via PiPhone – A Raspberry Pi based Smartphone. Dave Hunt doesn’t just do photography, he’s a Maker through and through. And the components are out there, you just need to know where to look to buy them. Once purchased then you get down to brass tacks of what IS a cellphone anyways. And that’s what Dave has documented in his write-up of the PiPhone. Hopefully an effort like this will spawn copycats enough to trigger a landslide in DIY fab and assembly projects for people that want their own. I think it would be cool to just have an unlocked phone I could use wherever I wanted with the appropriate carrier’s SIM card. I think it’s truly remarkable that Dave was able to get Lithium ion gel battery packs and TFT displays that were touch sensitive. The original work of designing, engineering and manufacturing those displays alone made them a competitive advantage to folks like Apple. Being first to market with something that capable and forward expansive, was a true visionary move. Now the vision is percolating downward through the market and even so-called “feature” phones or dumb-phones might have some type of touch sensitive display. This building by bits and pieces reminds me a bit of the research Google is doing in open hardware, modular cell phone designs like the Ara Project written up by Wired.com. Ara is an interesting experiment in divvying up the whole motherboard into block sized functions that can be swapped in and out, substituted by the owner according to their needs. If you’re not a camera hound, why spend the extra money on a overly capable, very high rez camera? Why not add a storage module instead because you like to watch movies or play games instead? Or in the case of open hardware developers, why not develop a new module that others could then manufacture themselves, with a circuit board or even a 3D printer? The possibilities are numerous and seeing an effort like what Dave Hunt did with his PiPhone as a lone individual working on his own, proves there’s a lot of potential in the open hardware area for cell phones. Maybe this device or future versions will break somewhat of the lock current monopoly providers have on their closed hardware, closed source code products. Even Moverio’s less powerful (compared to VR displays) head tracking would make something like Google Glass overheat, McCracken said, which is why Glass input is primarily voice command or a physical touch. McCracken, who has developed for Glass, said that more advanced uses can only be accomplished with something more powerful. via Epson Moverio BT-200 AR Glasses In Person, Hands On. Epson has swept in and gotten a head start on others in the smart glasses field. I think with their full head tracking system, and something like a Microsoft Xbox Kinect like projector and receiver pointed outward wherever you are looking, it might be possible to get a very realistic “information overlay”. Microsoft’s XBox Kinect has a 3D projector/scanner built-in which could potentially be another sensor built-in to the Epson glasses. 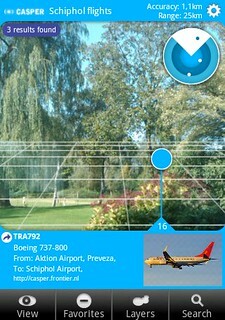 The Augmented Reality apps on Moverio only do edge detection to provide the information overlay placement. If you had an additional 3D map (approximating the shapes and depth as well) you might be able to correlate the two data feeds (edges and a 3D mesh) to get a really good informational overlay at close range, normal arm’s length working distances. Also as the pull-quote mentions Epson has done an interesting cost-benefit analysis and decided a smartphone level CPU and motherboard were absolutely necessary for making Moverio work. No doubt that light weight and miniature size of cellphones has by itself revolutionized the mobile phone industry. Now it’s time to leverage all that work and see what “else” the super power efficient mobile cpu’s can do along with their mobile gpu counterparts. I think this sudden announcement by Epson is going to cause a tidal wave of product announcements similar to the wave following the iPhone introduction in 2007. Prior to that Blackberry and it’s pseudo smartphone were the monopoly holders in the category they created (mobile phone as email browser). Now Epson is trying to show there’s a much wider application of the technology outside of Google Glass and Oculus Rift.